In the modern world, there is no reason to limit yourself to 20/20 vision. Remember that there is a reason why human beings are on the top of the food chain, and it isn’t because we are naturally faster, stronger, or more in tune with nature than other animals. We’re at the top because we’re clever, patient, and we can use tools. We’ve come a long way since the pinnacle of human tools was the sharpened stick, but the basic principle is the same. Our tools are our great advantage. Today’s apex predators use camouflage, animal scent, animal calls, and advanced weaponry to find, track, and hunt our prey. Among the most important tools available to us are those that enhance our natural senses. Whether you’re out gun hunting, bow hunting, golfing, or just looking to frame that perfect wildlife photo for your significant other, you can’t afford to leave home without the Wildgame Innovations Halo XRT Laser Rangefinder. With its unbeatable price and amazing variety of features, the Halo XRT Laser Rangefinder is an invaluable tool for any knowledgeable woodsman. The Halo XRT is user friendly, fast, and powerful. Best of all though, it is battle-tested. It was able to quickly and accurately gauge distances to a number of targets I met while bow hunting over the recent holiday weekend. The design is intuitive and simple. Without reading the manual, I quickly got a bead on a buck, and the accuracy of the measurement, available in yards or meters, allowed for nice, clean shot. I found that the advertised range of 500 yards was a conservative estimate. It is perfectly accurate up to 500 yards, certainly, but it also appears very accurate most of the time even closer to 1000 yards out. The 6x zoom and scan mode made active tracking of a moving target very simple, and counting buck points was no problem. While the monitor can be difficult to read clearly in the dark, this should not be a problem for most hunters, golfers, or photographers. While more powerful laser rangefinders are available, you would be hard pressed to find all of these features in such a portable package, let alone for such a reasonable price. Available at a cost considerably below the competition, the Halo XRT offers an incredible bang for its buck. In addition to the simple design and fast, accurate readings already described, it offers all of these features in a highly sturdy, portable form. The reliable rangefinder can last the entire hunting season on a single battery, in my experience. It is also weather resistant, light weight, and compact. It fits easily into the palm of your hand, a pocket, or a pouch. These are critical features for the modern hunter, whether that hunter is after bucks, ducks, or just a beautiful photograph. The Halo XRT also makes an excellent golf buddy for those looking for less extreme experiences with the great outdoors. 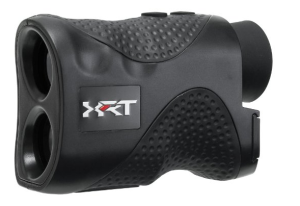 A relaxing day on the fairway could be hugely enhanced by the usage of the Halo XRT Laser Rangefinder. Fitting neatly into a golf bag, a pocket, or a helpful caddy’s hand, the Halo XRT has also proven itself again and again finding yardage to the green, or the flag and hole itself. Aim at the flag stick instead of the “soft target” of the flag itself, as soft targets are a notorious problem for all rangefinders. That said, the Halo XRT will complement your golf game perfectly, making club selection a real breeze. Overall, the Wildgame Innovations Halo XRT Laser Rangefinder’s reliability, portability, and price make it an amazing purchase for hunters, photographers, and golfers. Don’t leave home without one.